Brigid was born at the time of major transition in 5th century in Ireland. She embodies in herself the pre-Christian Celtic and Christian Celtic spirit. It is generally accepted that St. Brigid built her double monastery for men and women in Kildare around 470AD. A woman of wisdom and common sense, Brigid's genius for leadership and organization is widely recognized. Brigid was one of the many Celtic saints who insisted that a vital component of the spiritual life is having a soul friend (anam cara). Celtic Spirituality has a profound sense of the presence of God in everyone and in everything. IT is a spirituality nourished by ritual, tradition, contemplation, experience and story. Saint Brigid is one the few saints who stands on the boundary between pagan mythology, Druidism and Christian spirituality. 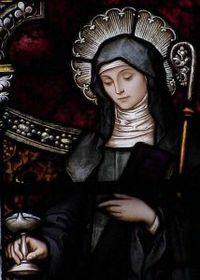 Saint Brigid is the most famous female leader of the early Celtic Christian Church. Brigid is remembered through the ages as a woman of the land. Her feast day on the 1st of February marks the first day of Spring in the noorthern hemisphere. It is the season when we celebrate new life on earth. It is believed that Saint Brigid's Cross protects the house from fire and evil. May Brigid bless the house that shelters you."